First Flight First flight in the Bakeng Deuce. I shook the stick to let Jim know I had it. But I shook it gently to let him know that I would happily give up control of the airplane if he even slightly suspected that I didn't know what I was doing. Which I didn't. Jim wasn't big on preflight lectures. In fact preflight conversation was limited to him asking if there was fuel in the airplane. 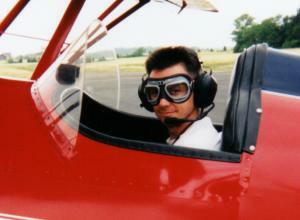 His instructional methodology was simple: you flew the airplane until you flew it correctly. I looked over the side at the small grass strip. Wind swirled around the front cockpit. This was it. No turning back. It's my airplane and I've got to learn how to land it. I flew the downwind at roughly a thousand feet. I didn't really know what the ground elevation was and never having flown into this particular cow pasture it was hard to judge where to make my turns. It was all very "seat of your pants" stuff. I turned base and everything looked pretty good. Then final and soon the field disappeared beneath the nose. Not a problem. I can slip an airplane. A little slip and the field reappeared. I checked airspeed - around 70 mph and everything still looked good. I fought back visions of ground loops - wing tips digging into soil, landing gear buckling and breaking, bits of wooden Sensenich propeller all over the place. I kept telling myself, "if I wreck the airplane then I wreck the airplane - so be it". I wasn't going to do anything to it that couldn't be fixed. I glanced in the rear view mirror. My instructor had the composure of a super hero. Could nothing phase this guy? Here I was about to kill him and he couldn't look less interested. Maybe he was suicidal? He didn't say anything, didn't touch the controls, just sat there. The ground neared and I gave a little pull on the stick, then relaxed a bit, then pulled - gently feeling the subtle changes in attitude. I sensed the ground behind the cowling and instruments. I didn't look to one side or the other but instead looked at both and tried to imagine the ground coming up. Was I straight? I glanced to the left. Everything looked okay but there wasn't much to look for. For a second I was almost completely detached from my senses. I glanced at the little parabolic rearview mirror on the edge of my cockpit. 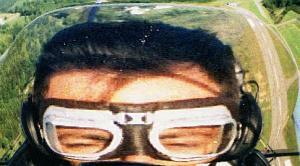 I could see myself, a distorted caricature, insect like, my bulbous nose supporting my leather aviator goggles. And I could see my suicidal instructor behind me, calmly observing the unfolding accident. Was my attitude correct? Was I too high? Why wasn't he saying anything? The wheels touched. A sweaty hand held the stick back. Somehow, we stuck to the ground. I worked the rudders. A little left, a little right, too much right, left, too much left. An orange highway cone streaked by the left side of the cockpit. A little right rudder so as not to hit the cones. Heavy on the brakes and we rattled to a stop. I looked around. "Did I just land this airplane", I wondered? I glanced in the rearview mirror expecting admonishment for nearly running over the highway cones. Jim was calmly adjusting his goggles. Maybe he didn't notice. This landing was followed by more landings in yet more little fields. Jim wasn't happy with short, flat fields and insisted on finding shorter fields with more interesting terrain. It wasn't enough to simply land the airplane. He wanted to demonstrate using an uphill slope to slow down on landing, then using the corresponding downhill for a quick takeoff. How about a grass field that suddenly ran into a section of paved strip about the width of a driveway? I started to worry less about my landings and more about clearing the trees at the end of one particularly short field, or hitting the fence at the approach to another. I began to understand Jim's quiet plan. It was almost zen like. As the student became complacent he was whacked with a bamboo cane. That was a great afternoon and I wouldn't trade the experience for anything. We must have put down on five or six different grass strips. I would imagine there aren't many flight instructors that can give you that kind of experience. I spent about ten hours hopping around with Jim, first on grass then on paved strips. While flying out of Culpeper, Virginia one afternoon we passed over fresh civil war style battlements, trenches, cannon and horses. Jim took the controls and flew a low pattern over the re-enactors. At one little ultralight field we passed a couple of curious guys by the runway. Jim stuck up his middle finger and said, "they don't recognize me". So I stuck up my finger . Smiling, they waved in a similar fashion. In retrospect it must be said that landing the duce that first time wasn't as traumatic as I've made it appear. Keep in mind that I did have a suicidal instructor who was intent on using me as the vehicle of his destruction. Even so I always felt in control of the airplane. My initial little weaves and swerves on the runway were due to under controlling, but heavier feet soon corrected that. Occasionally I'd touch on the main wheels, get a little more lift and float, pull back, settle in. All in all it was a lot of fun and one of the most rewarding experiences of my life. - Mark Williamson (1/30/2001) No copyright!